Using fresh peaches to make a peach shrub makes this Peach Bourbon Sour extra fresh and delicious! Post may contain affiliate links. Do you know what a shrub is? I’m not talking about the big green bush that blocks the view from your dining room window. I’m talking about the fruity vinegar infusion. A shrub is sometimes called a drinking vinegar. It is simply an infusion of fresh fruit, sugar and vinegar. It was popular in the colonial times and with the resurgence of craft cocktails, it is making quite the comeback. It adds a sour fruit essence to your cocktails that simply can’t be duplicated with anything else. As a bonus, mix it with some club soda or carbonated water and you’ve got a refreshing non-alcoholic drink! 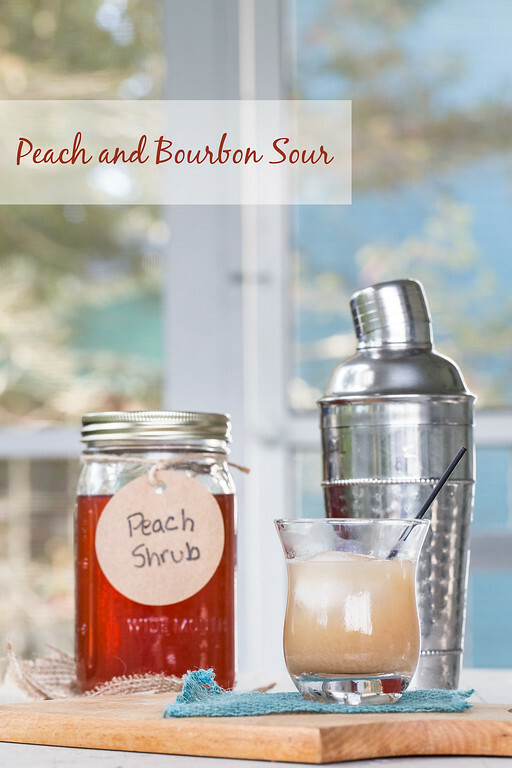 Click here to pin this Peach Bourbon Sour now! I’ve made shrubs before, a Strawberry Lime Shrub and a Blueberry Shrub, but never used them in a cocktail, so I was thrilled to see a peach shrub used in this Peach and Bourbon Sour from Sweet Paul’s Summer 2014 magazine. Do you get his magazine? I get the PDF on my iPad and just love it! To make this simple shrub, all you do is mix equal parts fruit (frozen peaches are fine here and sugar. Let it macerate overnight, strain out the fruit (I used it in a smoothie) and then mix the resulting syrup with vinegar. 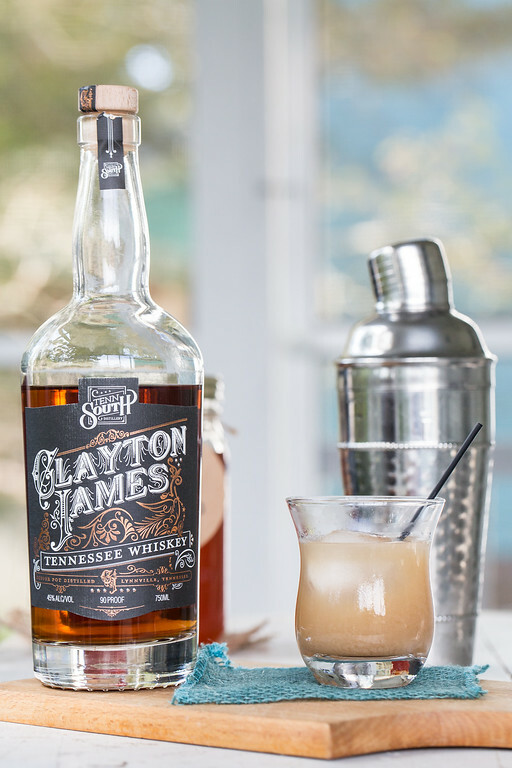 I suppose I should have changed the name of this from Peach and Bourbon Sour to Peach and Whiskey Sour, because I used some wonderful Clayton James Tennessee Whiskey for this. Personally I have no idea what the differences are between bourbon and whiskey, I use them interchangeably. This recipe makes a jar of shrub, way more than you need for this cocktail. I used mine with carbonated water for a refreshing non alcohol drink! This Peach Bourbon Sour uses a peach shrub (a drinking vinegar) for a tart, sweet and delicious cocktail! Wash, peel and pit the peaches and then roughly chop them. Place in a large bowl, add the sugar and toss to combine. Cover with a clean cloth and let sit out overnight, stirring occasionally. Line a strainer with cheesecloth and set over a wide mouth jar or other container. Ladle the fruit into the strainer and let the liquid strain through. Press on the fruit to get as much juice as possible. (At this point, I stored the fruit in the freezer for smoothies.) Add the vinegar to the peach liquid. Cap and store in the fridge. This makes enough shrub to make several cocktails - it's also good mixed with carbonated water for a refreshing drink. Put all the ingredients in a cocktail shaker and shake vigorously until the egg white is foamy. Add some ice and shake again for 30 seconds. Strain into a cocktail glass filled with ice. The calorie count on this recipe was tricky because the recipe makes a large amount of shrub. I used a combination of simple syrup and vinegar to come up with a close enough amount. Requires a day for shrub to infuse. What a delicious cocktail, Pam. I love that you made your own shrub! Thank you for sharing, and for being a part of the Hearth and Soul Link Party. Hi again, Pam! Just to let you know I’ve featured your post at this week’s party. Hope to see you there! Thanks so much for the feature April!